Brian Penny has been a tech journalist since 2011. His work has appeared in Fast Company, Forbes, Paste Magazine, HuffPost, and Cracked. Alexa is a great voice-activated virtual assistant from Amazon, but while the Echo and Echo Plus have respectable built-in speakers, other devices like the ​Echo Dot are more limited. You might prefer to connect an external Bluetooth speaker, especially when streaming music. Check the manufacturer's website to find out if the Bluetooth speaker you want to connect is Alexa-compatible. If so, Alexa could then be used through the manufacturer's app (with a few caveats). If not, you can connect it through an Echo device. This guide will walk you through how to connect Alexa to a Bluetooth speaker, depending on what devices you're using. Alexa is meant to be a digital assistant controlled by your voice. Before digging through app menus, try asking Alexa to pair with your Bluetooth speaker. Use one of the following commands to set your Alexa-powered device to pairing mode. It will respond with "Searching." Now, put your Bluetooth speaker into pairing mode. This is typically done by pressing a physical button on the device called Pair or labeled with a Bluetooth icon. If you successfully paired Alexa and the Bluetooth speaker, it will respond with "Now connected to (your device's name)." If the device isn't found, Alexa will respond by reminding you to enable Bluetooth on the device or use the Alexa app to connect a new device. Download the Amazon Alexa app on your phone or tablet. Get it from iTunes for iOS devices and the Play Store for Android. Sign in to your Amazon account from within the Amazon Alexa app. Tap Devices on the bottom right of the app. Choose the plus icon at the top of the screen and select Add Device. Put your Bluetooth speaker into pairing mode. Tap Speaker in the Amazon Alexa app, select the speaker manufacturer you want to pair, and then tap the Bluetooth speaker from the list. When successful, you should hear Alexa say "Now connected to (insert device name)." Power on your Fire TV device. Scroll to Settings in the menu at the top of the screen. Go to Controllers & Bluetooth Devices > Other Bluetooth Devices > Add Bluetooth Devices. Put your Bluetooth speaker into pairing mode. When connected, you'll see an on-screen confirmation, and the speaker will be listed as a paired device. You can also connect your Echo device to your Fire TV. In this case, only one version of Alexa can be connected to the Bluetooth speaker at a time. If you pair the Bluetooth speaker with the Fire TV, you’ll hear and talk to Alexa from your Echo speaker and hear content played through Fire TV on the Bluetooth speaker. Alexa skills like your flash briefing will still play through the Echo speaker while watching Hulu, Netflix, etc. will play audio through the Bluetooth speaker. In this configuration, you can use the Fire TV remote to control Pandora, Spotify, and other available TV music services through the Bluetooth speaker. 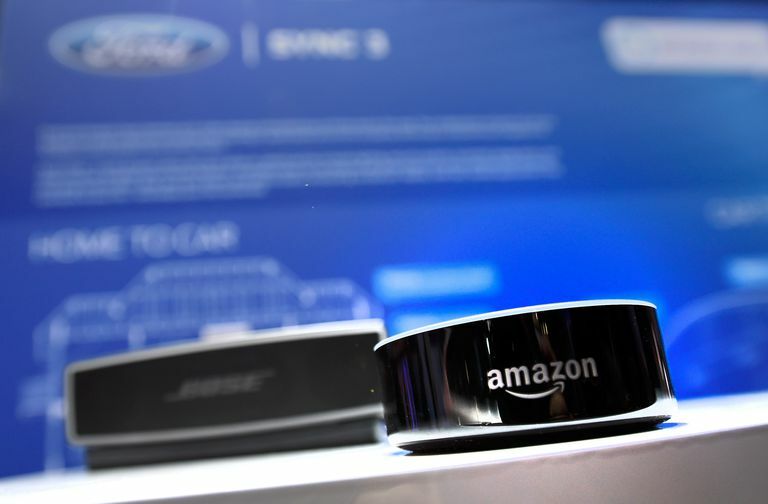 Voice controls like “Alexa, open Pandora” will still control Alexa on the Echo device, but commands like “Alexa, stop” or “Alexa, play” will control the Fire TV app. Otherwise, the Echo Alexa will play from the Bluetooth speaker, while FireTV content will play through the TV speakers. If a third-party Bluetooth speaker (i.e., the Libratone Zipp, Sonos One, Onkyo P3, and most UE speakers) supports Alexa, you can control it with manufacturer’s app. Be aware, however, that only Amazon Music can be used for these devices. To stream songs from Spotify, Pandora, or Apple Music (even with a paid account), you need an Amazon Echo-branded device. The exceptions are speakers like the UE Boom 2 and Megaboom, which include a feature called “Say it to Play it.” These speakers access the virtual assistance on iOS and Android devices to stream music from various services. Sonos in the U.S. supports Amazon Music, Spotify, TuneIn Radio, Pandora, IHeartRadio, SiriusXM, and Deezer, although much of this content isn’t available in the UK or Canada. Exact wording and navigation will vary depending on the individual app. Scroll to Add Voice Control and select Add Amazon Alexa. Connect your Amazon account using the email and password related to it. Download the Alexa app when prompted. It's available from Google Play for Android devices and iTunes for iOS devices. Link the preferred music services (i.e., Spotify) through the Alexa app by pressing the three-line icon on the top left corner, selecting Music, Video, & Books, and then choosing an item from the menu. Link the preferred music services on your third-party app.